You are here: Home / Destinations / Exeter, Devon’s unexpectedly lively capital city. Exeter is not the typical sleepy Devon town you imagined! Exeter is without doubt the capital of Devon, though ironically it’s not the typical town that most visitors come to expect when they think about Devon. There’s a certain high pace and vibrancy about Exeter that is out of place with the rest of the county. 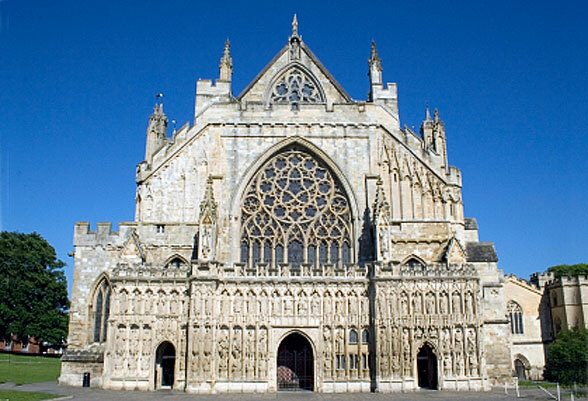 Not only is Exeter the most culturally and commercially important place within Devon – it has a famous university – but it boasts a vivid historical importance with plenty of old buildings and other important landmarks of heritage. The holiday maker who visits Devon should at least pop in to Exeter for a visit. There’s a lot about Exeter that a quick walk reveals. The city wall remains date back to 200 AD (initially built by the Romans) and what is now the High Street is pretty much the street plan that was laid out since Roman times. Impressive St. Peter’s Cathedral was originally built in the 11th century. The Cathedral still features two massive Norman towers that were part of the original building when it was consecrated in 1133. The building is one of the finest examples of late medieval architecture in Britain. At Cathedral Close is the timber-framed Mol’s Coffee House, one of the finest buildings here. Ten-minute walk from the Cathedral and you’re at the historic quayside, one of Exeter’s most attractive areas of the city. Its history dates back to Roman times, and there is still evidence of Exeter’s wealthy maritime past in the fascinating architecture. While you’re here, visit the Quay House Visitor Centre which covers 2,000 years of Exeter’s history. Don’t worry, it won’t take you 2,000 years – you can skip through it in just 15 minutes! The Quayside is also an ideal place to try an irresistible Devon cream tea. The Quayside is a hub of activity in the summer months with all kinds events including Dragon Boat racing! You can go on boat trips or cross the river on Butts Ferry, one of only five floating bridges in the country! You can also hire canoes and pedalos from the Quayside. Other notable places of interest include the Guildhall, one of Britain’s oldest civic buildings, Royal Albert Memorial Museum (closed till 2010 for refurbishment), St. Nicholas Priory where you could step back in time and experience Tudor life first hand and the opulent Customs House by the Quay. If you’re interested in rare plants, check out Exeter University’s Streatham campus. Exeter has developed significantly in recent years, and offers visitors and residents a huge choice of entertainment and leisure. It boasts one of the most vibrant nightlife scenes in Devon and there are plenty of restaurant choices too, from tapas and Thai to Middle Eastern and Latin American. Hotels in Exeter include luxury four star hotels and boutique town houses. Some of the hotels in Exeter are located in historic buildings, so you can really take in the atmosphere of this beautiful and historic city. If you want to escape the city, there are wonderful country house hotels, set in acres of wide open space, giving you a sense of ‘getting away from it all‘. Each hotel has its own restaurant,several of which are award winning eateries. Close-by to Exeter is the lovely estuary port of Topsham. This bustling port is a perfect example of a prosperous and charming English town. Walk along the narrow streets, take in a coffee at a canal-side café and if possible hop onto a bus for perhaps the best way to explore the nooks and crannies that Topsham has to offer. Foodies will appreciate Topsham with its many historic pubs and award-winning restaurants – good food is a Topsham speciality. Topsham’s charming passenger ferry takes passengers (and bikes) across the Exe to enjoy walks or lunches at idyllic waterside pubs. You can also take short or long cruises to discover the wildlife of the Exe estuary or to Exmouth’s sandy beaches. The narrow Goat Walk beside the Exe estuary offers wonderful views and sunsets. Very close to Exeter (2 miles) is a lovely little town called Ottery St Mary – offering some of the most winding streets to be found anywhere, and a wonderful ancient church that stretches back to the 14th century. Also close to Exeter is the town of Sidmouth which has plenty of smart villas and cottages.